It’s also no secret that Optimo and Sub Club go way back… holding their Sunday night weekly residency in the club from 1997 – 2010. 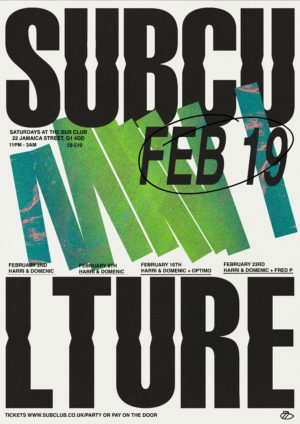 So what a pleasure it is to have them with us, this time on a Saturday night, at Subculture with their very good pals Harri & Domenic. This will truly be a ‘masters at work’ kind of night!